During late 1950’s, TOHO produced series of short featurette, most of which were approximately an hour in length. These films were called “Diamond Series” and meant to be fillers for theatrical programs. In spite of their secondary status in terms of box office, the series called for seasoned directors, staffs and actors. “Shitamachi (下町)”(Downtown) is one of the best of the series, though rarely shown. In 1949, four years after the war, Tokyo was still in rubbles. It was a harsh environment for a woman looking for a decent job. Riyo (Isuzu Yamada) and her little son try to survive this acidic world around them. Her husband, a soldier during the war, was probably detained in Siberia, with no prospect of returning. She tries to make her living by selling packs of tea from door to door with little success. After an unfruitful day, she finds a shack along the river bank and asks its owner, Tsuruishi (Toshiro Mifune), if she can warm her hands near the fire. It turns out the owner himself was a soldier, who had been detained in Siberia for a few years after the war, as her husband is now. Tsuruishi is a loner, now working as a scrap collector, whom she finds a warm, sympathetic human being. After this first encounter, she finds herself visiting his place frequently and her son also likes him who provides him a fatherly protection. Riyo finds slight hope in Tsuruishi’s sincerity and lively energy. But a slight mishap squashes her little fancy to the ground. This is based on a very short story by Fumiko Hayashi of the same title. Her works are mainly associated with the films of Mikio Naruse, such as “Repast (1951)”, “Late Chrysanthemums (1954)” and “Floating Clouds (1955)”. Though Naruse was considered for this film as well, it was Chiba who was assigned for the project. Chiba directed this little gem with restrained atmosphere but very straight-forward storytelling. Though the original novel is a little sketch of frivolous swing of fate, which fell upon a helpless woman, the film adds the repugnant background that tries to pull her into further misery. Her tenement is a barely disguised brothel, operated by its landlady. A prostitute next door, whose husband is now in death bed, is trying to raise money for hospital bills. The landlady suggests Riyo to do the same, which would pay her ample. Though she refuses it in silence, we know she might have to do it someday. This subplot acts as a sort of an amplifier for the tragedy, making this film adaptation more disturbing than the novelette. The film was shot in 1957, well after Tokyo had been rebuilt to become the modern Metropolis. This is the year of “Tokyo Twilight (Ozu)” and “Throne of Blood (Kurosawa)”. Baseball became the entertainment of the nation, while TV sets and new automobiles were objects of envy among middle class. This must have been a painful lookback at what Japanese had to endure a decade before. But Chiba did not pull any punches, baldly tackling with the misery of the time. Its honest description of loneliness of women, of abandoned hopes of young men and of dysfunction of the society might have been only possible well after the pain had faded. Restrained performance by all (Yamada and Awaji are superb, but it is Mifune I find most engaging) reinforces the bleakness of the time. This film reminded me of “Il Grido” by Antonioni of the same year. While two films are quite dissimilar in their subject matters, desolate landscape surrounding the protagonists have similar overtones. 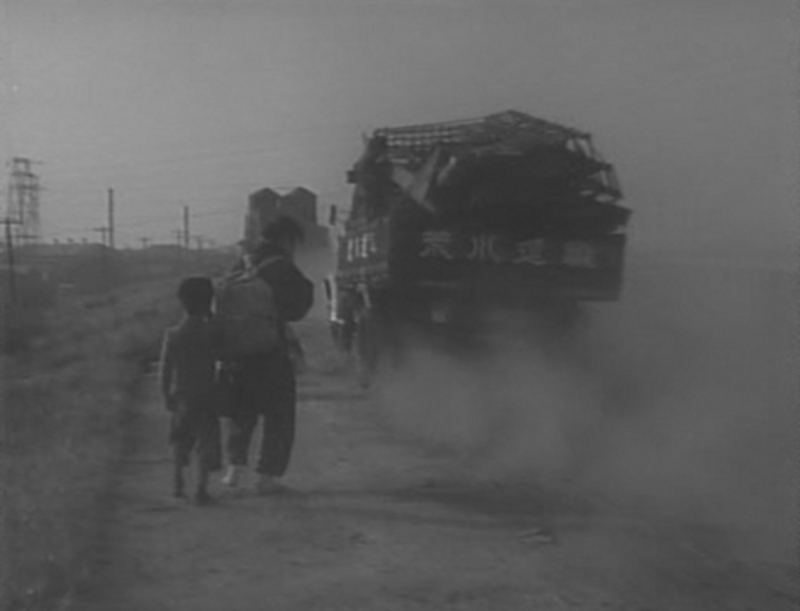 Also, act of walking, or wandering on foot, are central to both films, creating the tempo of aimlessness in dusty land. However, “Il Grido”, Italian international success, overly dramatizes its ending, faithfully following Italian Opera tradition. Dramatic suicide seems to be a revenge too sweet on aimlessness of life. In “Downtown”, the final scene provides the fatal blow to an already broken soul. After hearing the Tsuruishi’s tragedy, Riyo and her son are back at square one, more lost than ever. They aimlessly walk on the river bank, speechless. Then suddenly, the son finds a body of a dead cat, to which his gaze is glued with shock. The boy’s silent blank expression evokes us the helpless feeling of childhood. Riyo hugs him, bringing him back to the reality of living. The last shot is a row of roaring trucks, violently passing them by, whirling up dust. Surviving is much harder to swallow sometimes.